“It will be quite unlike any land you know”, so said Rudyard Kipling, so prepare to be amazed, dazzled and moved by all that you will see and experience in this intriguing land. Formerly known as Burma, Myanmar is a beautiful treasure trove of pristine nature, majestic, ancient religious sites, the mighty Ayeyarwady River, mysterious cave pagodas and beautiful white sand beaches. The Burmese people, are warm and welcoming and cannot wait to share their rich traditions, customs and culture with you. Following years of inaccessibility Myanmar has recently opened its doors to visitors hungry for new experiences. The twenty first century world has barely touched this gentle land, so prepare to be captivated by a strong sense of the old Orient, of untouched beauty and spirituality. Temples appear at almost every turn, particularly in Bagan, where thousands of ancient temples and pagodas are strewn across a sprawling dusty terrain. Hire a horse and cart to leisurely take you around these extraordinary monuments, which include the well-preserved Temple of Ananda and the gold-domed Shwezigon Pagoda. Yangon (formerly known as Rangoon) was the British colonial capital and is noted for a number of famous religious sites, not least of which is the country’s treasure – the imposing golden Shwedagon Pagoda (sunset vistas are highly recommended). It’s bustling streets and narrow alleys are filled with shops, markets and tea houses where the aroma of spices and freshly-cooked food wafts through the air. Mandalay is Myanmar’s cultural centre, full of craft workshops and tree-shaded monasteries. From Mandalay Hill enjoy magnificent views (particularly at sunset) over the city and Ayeyarwady River, as it meanders through the countryside beyond. On another day visit the 150 year old U Bein teak bridge, built in 1851, for an amazing sunset. Visit Inle Lake to witness a unique way of living. The Intha people live in villages built on stilts over the water, grow vegetables on floating gardens and travel by boat everywhere! Remarkably, they row standing up with one leg wrapped around an oar! Kalaw is a former British hill station with many colonial buildings including the “post office”. Lying around one hour drive from Heho, it is renowned for its hill tribes and for trekking in the mountains and pine forests, which offer an opportunity to enjoy the cooler air. Ngapali is renowned as the country’s best beach. There are no noisy beachside bars and no crowds, all that’s on offer is unspoiled beauty, peace and white sand lapped by deep blue water stretching as far as the eye can see. Travelling by river is a fantastic way to observe everyday life, wildlife and the absorbing scenery, and a variety of river cruises provide a leisurely option for exploring this captivating land. Stylish vessels offer a selection of cruise itineraries along the Ayeyarwaddy River and smaller tributaries, visiting temples, pagodas, palaces and monasteries along the way. While Myanmar’s cities are not on a par with neighbouring Asian capitals, there are still bargains to be found. Mandalay is a good place for traditional handicrafts, while Yangon has several large shopping centres and in Bagan artists often sell their work directly to tourists. If time allows visit a traditional teahouse, they are a great place to sit down for a simple snack, meet the locals and take in the street life. Our vastly experienced travel advisors are passionate about Myanmar. With first-hand knowledge of when and where to go they can create the perfect holiday experience for you, at the best possible price. Flight duration: There are no non-stop flights from the UK. However, Yangon is just over an hour from Bangkok, 2 hours 40 minutes from Kuala Lumpur or 7 hours from Doha. Recommended airlines flying non-stop from the UK to Yangon: There are no non-stop flights from the UK. Recommended airlines that fly indirectly from the UK to Yangon: EVA Air (via Bangkok), Malaysia Airlines (via Kuala Lumpur), Qatar Airways (via Doha), Singapore Airlines (via Singapore) or Thai Airways (via Bangkok). Local time: GMT +6.5 hours. Currency: Kyat, pronounced �chat� but US$ is used to pay for goods and you get Kyat in return! US$ notes must be clean and new. Credit cards and travellers cheques are not generally accepted, however Visa and Mastercards may be accepted at some hotels and large restaurants. 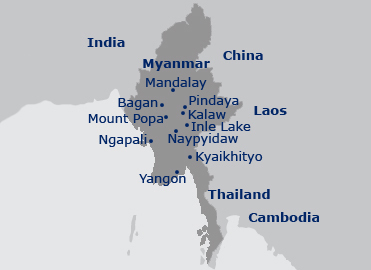 Language: Burmese. English is widely spoken. Best time to travel: The best time to visit most of Myanmar is November to February. From March to May the temperature rises considerably and the monsoon rains arrive from May to October. If travelling to Ngapali Beach the best time to visit is between October and April as outside these months, the monsoon weather can be inclement and many hotels close.